See our facilities firsthand and meet us in person. Schedule a tour soon. See you at Malamav Community and Human Services, Inc. 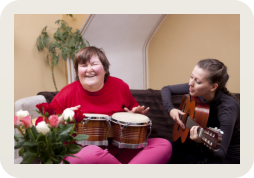 Welcome to Malamav Community and Human Services, Inc.
It’s a common notion that those who are developmentally disabled might find it difficult to find fulfillment in life. For these individuals, the road to happiness and independence is wrought with so many struggles and challenges. But this notion can be changed. At Malamav Community and Human Services, Inc., it is our goal to partner with these individuals and their families, guiding them through their incredibly tough journeys and providing the support and assistance needed to achieve their goals. The lifestyle of our clients’ dreams, the one they have always adored, is what we seek to accomplish through our top-notch facilities and services. While we never know what life throws at us, it is important to always be ready and never give up. With the enduring help of Malamav Community and Human Services, Inc., one is always guaranteed to have the means to live an independent and dignified life. Our commitment is to making every single day for you and your loved one as special as possible. Whatever you imagine for your ideal life, we will make it happen for you. A day spent at our facility is a day you will always remember. We want you to choose us because we believe that you deserve nothing less than the care we are able to offer. Let us get to know each other today. It would be an honor to team up with you and your family to achieve an incredibly fulfilling care journey. Malamav Community and Human Services, Inc. is a private non-profit human services organization and the leading DBHDD, CCSP provider in Georgia, that has been providing quality services to adults with Developmental Disabilities since 2007. We deliver services with utmost compassion, reliability, and professionalism. If your loved ones are struggling to navigate the challenges of their physical or mental impairments, send them over to our homes as soon as possible. We provide a ton of amazing options that will help them conquer such difficulties and accomplish a life with happiness and fulfillment. Call us now to start the experience. Simply dial 770-943-4641 / 678-802-7337 or send a message to privatehomecare@malamav.org/ officemailbox@malamav.org. To provide the best practice in the provision of healthcare while ensuring each individual is treated with respect and dignity. To Ensure each individual is provided the support that is needed so that may remain in the community as long as possible. Provide opportunities for individuals living in the most integrated community settings appropriate to their individual requirements and preferences. Ensure activities of daily Living Skills (ADL’s), exerting meaningful choice and providing quality services in a manner that is consistent with the community living preferences and priorities. To provide the best practice in the provision of healthcare, while ensuring each individual is treated with respect and dignity.